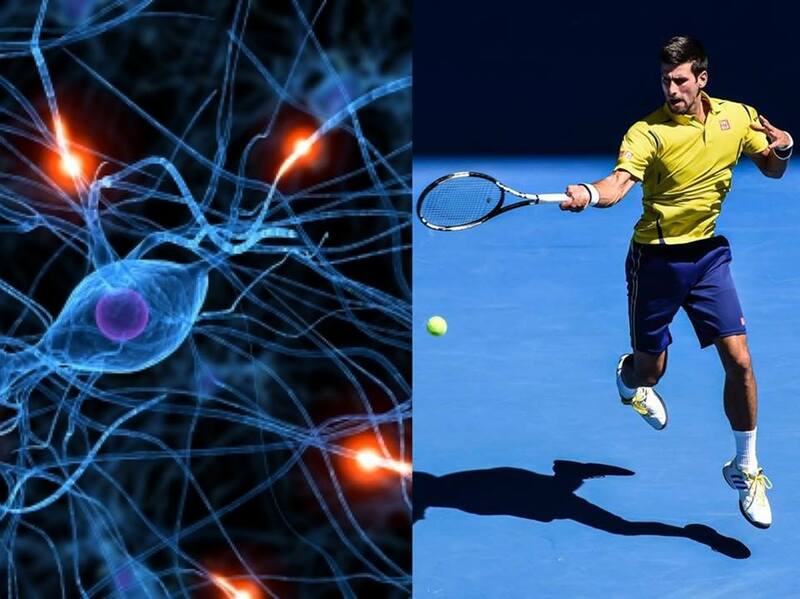 If you are watching tennis, here is an interesting fact about your brain. Whatever your favourite player, your brain can’t help playing both sides, all roles. What your eyes see, your brain plays — as best it can, which is, of course, as variable as our actual playing and living. The evidence that the spectating brain is also a playing brain has been mounting ever since the early 1990s, with the research of a group of neurophysiologists in Italy. It all started when they found out exactly which neurons fired when a monkey grasped a peanut and brought it to his mouth. The electrodes were monitoring the premotor cortex, the region known to initiate signals that direct muscle movement in both macaques and humans. The researchers hoped that pinpointing the individual motor neurons that fired when the monkey grasped the peanut might lead to therapies that could help brain-damaged humans recover hand function. The Italian team succeeded in their original brain-mapping goal, but it was an accidental discovery that made the team a world-renowned source of cutting-edge neuroscience: A researcher in the lab was eating peanuts one day when he heard a monitor buzz, indicating that the monkey’s peanut-grasping neurons were firing. But the monkey had no peanut! After a moment of puzzlement came the researcher’s “eureka!” moment: Some of the same motor neurons that fire when a monkey performs an action were also firing when he watched someone else perform that action! The researchers wondered what the difference was, from our brain’s point of view, between doing and seeing, between playing the game and watching the game, and, most fundamentally, between one’s self and someone else? The answer is that the difference is about 80 percent. In other words, about one-fifth of the neurons that fire in the premotor cortex when we perform an action (say, hitting a tennis ball) also fire at the sight of somebody else performing that action. This neurons that respond to others’ actions as if they were our own are called “mirror neurons,” and they seem to encode a complete archive of all the muscle movements we learn to execute over the course of our lives, from the first smile and finger wag to a flawless triple toe loop. When we see a familiar action, our mirror neurons activate, and their firing lasts exactly as long as the observed action. This allows us to instantaneously understand the action, its goal, and even the emotions associated with it, without having to do any inferential thinking about it. If we are watching strenuous action, mirror neurons even provoke a small but measurable uptick in our heart and respiration rate. In the nearly 20 years since this amazing discovery, hundreds of research projects around the world have studied mirror neurons to learn about everything from how we acquire language to how we develop empathy. But what mirror neuron research has to say about sports spectating, especially watching sport? A study was conducted at The University of Rome, where neuroscientists recruited professional basketball players, expert watchers (basketball journalists and coaches), and students who had never played basketball, and made them all test subjects. Using a technique which yields the exact timing of neuronal firing, the researchers monitored the patterns of brain activity (for movement) in all three groups as they watched free throw videos. The result: Everyone’s motor system perked up watching the action, but the students showed a generalized perk-up, while both players and expert watchers showed activity of the specific motor areas involved in shot-taking. What separated the players from the expert watchers, though, was greater excitation of the hand muscles controlling the ball, especially the muscle controlling the angle of the pinkie finger at the instant the ball left the shooter’s hand. There was not necessarily visible movement of the pinkie, but a measurable increase in the activity which signal preparation for intended action. But here’s the most unpredictable result: This activation was greatest when players watched the launch of a ball that was going to miss the basket! Maybe the brains of the spectating players were not just simulating the shot-taking. Maybe they were trying to score. And so, perhaps, are we. The mirror neuron research suggest that there is a sliding scale of mirror neuron response among spectators based on their real-life sports experience. Marco Iacoboni, a neuroscientist at UCLA and pioneering investigator of the mirror neuron system, says the brain monitoring technology used in the Rome free throw study is best at measuring mirror neurons that fire at the sight of an action that exactly matches one in the spectator’s brain (we call them “congruent”). Other mirror neurons are “broadly congruent,” meaning they fire at observed actions that are similar to ones you have performed. About two-thirds of our mirror neurons are like this, “which suggests to me that the purpose of the mirror neuron system is to get you more attuned to the goal of the action than the action itself” says Iacoboni. In sports terms, this means if you are watching someone take a free throw, and you have never played basketball, your strictly congruent mirror neurons will not fire, but the broadly congruent ones that remember tossing a crumpled piece of paper into a wastebasket will. Analytic language may put the damper on our brain’s movement areas, but that is not the case with other kinds of language. Research using football and hockey players produced evidence that mirror neurons are activated not only when we see or hear action, but also when we listen to or read descriptions of it. And as with the response to sights and sounds, the degree of mirror neuron activation, which speeds up comprehension, depends on our individual experience with what’s being described. Even when reading, one of the ways we understand information is by calling on those motor systems we used to act in the past. So for someone with a lot of experience playing, reading about tennis, for instance, has what we call ‘motor resonance,’ because they can call upon the parts of the brain they used playing to simulate the action in their heads, and that often makes what they’re reading easier to follow and makes them like that information better. Is this enhanced comprehension just a matter of their having heard or read a lot of tennis language, because they were players? Yes, background knowledge certainly aids comprehension, but our brain also reuses motor experience we learned doing things to comprehend what we are watching or reading about. All of our experiences of doing in the world contribute to our comprehension of the world. It turns out, for instance, that we reuse areas of the brain that control our fingers when we count in our head, because at one point we learned to count on our fingers, and those same areas of the brain come alive again. So, analysis has its place in sport but not as big a place as we have been giving it. Over-analysis leads to limitation rather than increase performance. The well-known “paralysis by analysis”. It’s really time for coaches – in all sports – to say less, show the right movement and let time for the student’s brain to put everything together. He did it when learning to walk, he can do the same to learn his forehand! In resume, keep watching tennis on TV, turn of the sound when commentators analyse everything, and stop analysing everything yourself! Trust your mind, forget for a moment the “how to”. Just enjoy!